August 12th, 1-5pm in the Rec, the Hub and Football Field. Something for everyone from 6-18yrs. Dear All, please follow this link to fill in our lake user survey, needed for future funding purposes. Meet at 11am at the Hub to go out into the Rec to cut thistles in the picnic area. Meet the Friends and find out what is going on in the park and how you can get involved. Pruning of fruit trees (cherries, plums, almonds) and tree care (eg. needed and all equipment will be provided. and permaculture tutor from Manningtree in Essex. Friends of Lordship Rec Practical volunteering. Meet in the Hub Cafe 11am. Watering newly planted trees in the south west margin of the main playing field. Meet at the Hub at 2pm, and bring a watering can (preferably 10 litre) if you can! The Lordship Wildlife Group meets at the Hub on the 4th Tuesday of every month. Including some practical work around the Rec. All welcome. Lordship Wildlife Group meets on the last Tuesday of each month at the Hub from 2pm till 4pm, including some practical work around the Rec. 2 morning walks ending up at the Rec in time for the event. One starts 11am at the BBC TV Tower at Alexandra Palce and passes through parks, conservation areas and listed buildings. The other starts at 11.30am from White Hart Lane Station and follows the route of the Moselle River. Both should end by 1pm at the Hub Cafe. 4 Talks and presentations from 1-5pm. 1pm: Gina Bradbury Fox will give a presentation of Julia Bradbury’s (Countryfile and Britains Best Walks) fantastic website: The Outdoor Guide. 2pm: Morag Rose from Loiterers Resistance Movement (LRM), a Manchester-based Collective of artists and activists who aim to nurture an awareness of everyday space, looking at it from new angles. They organise monthly wanders through the streets of Manchester, uncovering hidden histories and finding the extraordinary in the familiar. They engage in inventive activities like CCTV bingo and giant cake maps. Intrigued? Then come to the illustrated talk and find out more! 3pm: Jeremy Leach, from 20s Plenty for Us, will talk about the many national campaigns to make streets safer and more pleasant for pedestrians, including a 20mph speed limit in towns. 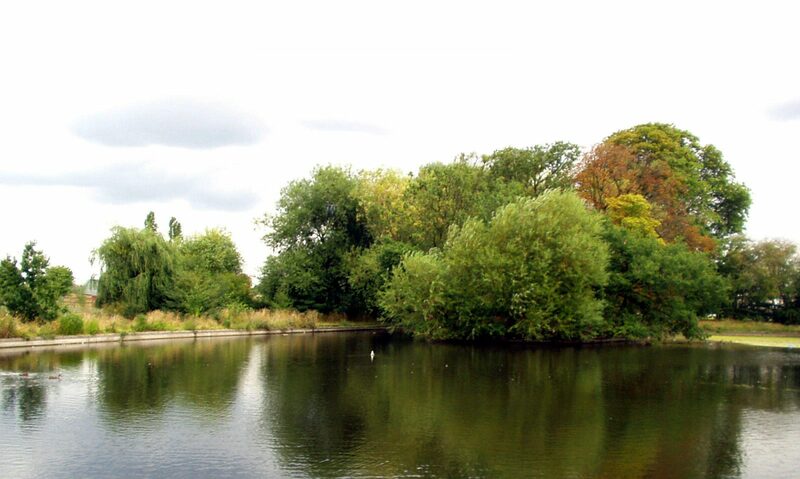 4pm: Joyce Rosser from Haringey Friends of Parks Forum will talk on The Moselle: discovering Haringey’s natural and historical heritage by walking the route of one of its hidden rivers. FREE event with walks, stalls and seed share. 3 short walks in the Rec by knowledgeable leaders: 1. To identify trees, 2. To identify wild flowers, 3. To identify birds, butterflies and bees. Bring along your spare seeds to share at the seed swap. Organised by the Lordship Rec Wildlife Group and Growing in Haringey aiming to increase biodiversity. We are going to be preparing the lake for new planting early next year ready for the Spring. We will be constructing gabions, (metal cages full of stones) and positioning them along the inside edge of the lake ready for planting in Feb or March. We have chosen some new plants to go in the lake for next year which will create new habitats for wildlife, increase the health of the lake and also look lovely. If we have time, we will also be constructing some new floating islands for the birds to use as nesting places. Please feel free to come along and join in this outdoor work between 10am and 3pm on the above days. Buy your Hub Lordship Rec calendars and cards at the fair! All photos taken by Rec users.